This might seem definitive if it were not for a troubling listing on ebay a short while ago of a Rogers Imports-era Shamrock 107. The photograph is distorted, but the number does appear to be a 107. The rim has been inexpertly rounded and the stem probably not original, as Shamrocks from this era were fitted with P-Lips, not fishtail stems. Still, it makes you wonder. The shape next appears around 1992 in the “Handmade” brochure as the “XL Billiard 107,” in the re-booted Sterling Silver line, which had been around since Rogers Imports introduced it in the late 1940s, but not seen in the ephemera for about ten years or so before resurfacing in the early 1990s. 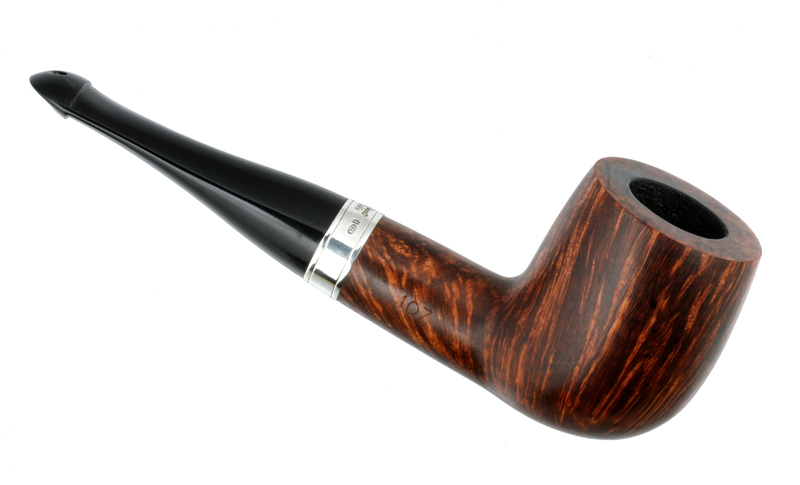 While Peterson is known for its iconic bent System shapes, from the very beginning they also made straight pipes—first the small-chambered Patents, then traditional English shapes, which of course morphed into the bigger, bolder, and more masculine shapes for which Peterson is renowned. The 107 is about as “Peterson” as a straight pipe can get in its design language, especially if coupled with the graduated-bore P-Lip stem—which also gives it a dryer, cooler smoke and relieves the pipeman of the necessity of running a pipe cleaner down the stem half-way through the smoke. The 107 is part of the “100” series line, which dates back to the 1906 catalog. Interestingly enough, the number itself seems never to have been used officially until 1979, or at least, it is undocumented in the ephemera we have seen so far. The 1906 catalog has a number of classic billiard shape: 101, 102, 103, 104, 104, 105, 106, 109 (not to be confused with the XL diamond-shanked 109 of recent years), and 110, but no 107. 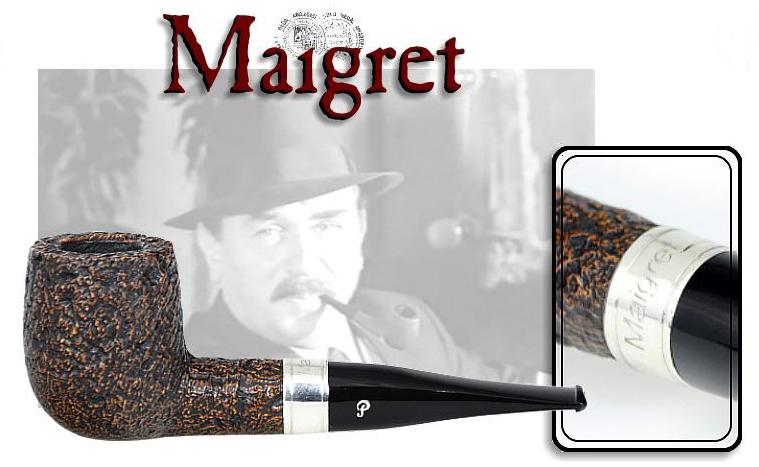 I came to straight Petes fairly recently in my smoking, thanks to the encouragement of Phil Blumenthal over at the IPPC, and tried a Maigret 107 about a year ago. I found the pipe too heavy and uncomfortable with its fishtail acrylic stem, and let it go. A few months ago I spotted the 107 in a Flame Grain, and with the P-Lip it seemed the very epitome of Peterson’s best Chubby Aesthetic, so I went for it. What makes a pipe a “Chubby” is a matter of some debate, but as far as I’m concerned it has to do with the thickness of its bowl, bowl walls, stummel and stem compared with traditional shapes in its classification—as a billiard, in this instance, it will be considerably more “inflated” than other straight billiards. * The tapered effect of the 107 P-Lip on its massive stem contributes significantly to making the shape look not merely large but truly Chubby. 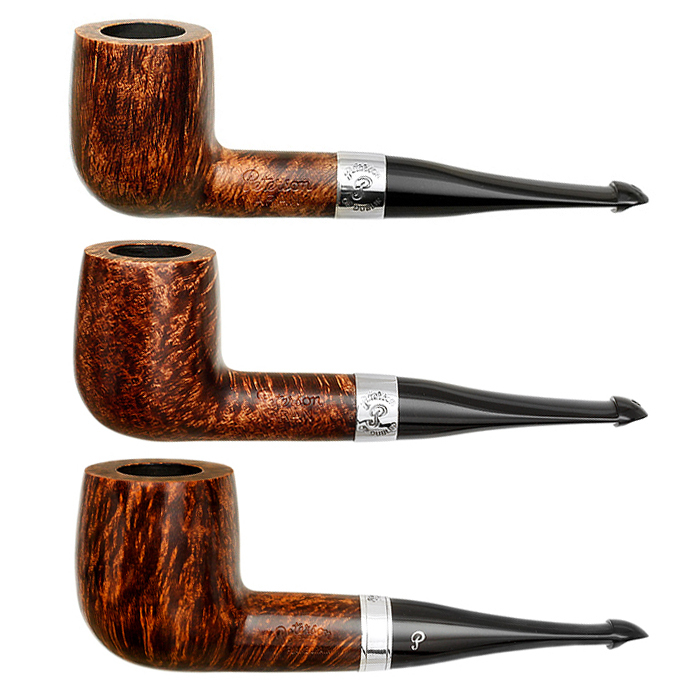 All three pipes retain what I think of as the classic bowl geometry of 2 : 1, depth by width, making them great all-around pipes whatever your tobacco tastes, but particularly desirable for Virginia flake and Va/Per smokers. Currently the 107 appears in a number of Classic Lines, including of late the Christmas 2014 and Dracula series, but seems to be available with the P-Lip only in the Flame Grain, Killarney and Dublin Filter. I wish the 107 P-Lip was more widely available, as it is actually easier to grip in the mouth than the fishtail. The Flame Grain runs about $160 (and you’ll see a fill or two). Sometimes it shows up in the Killarney entry grade (under $100) as well. I’ve also spotted the 107 P-Lip in the older U.S. Rock of Cashel line as well as the Dublin Filter, but sadly, not in the Aran, where I think it would be a natural. *My diatribe on Chubby pipes can be found at http://www.neatpipes.com/blog/built-for-comfort-a-short-history-of-the-chubby-style/&id=7. 107 is the straight chubby? Cool, I’ve got some of them too! I’m interested in what lines you’ve got–? I have a pic but can’t send it here from my phone. 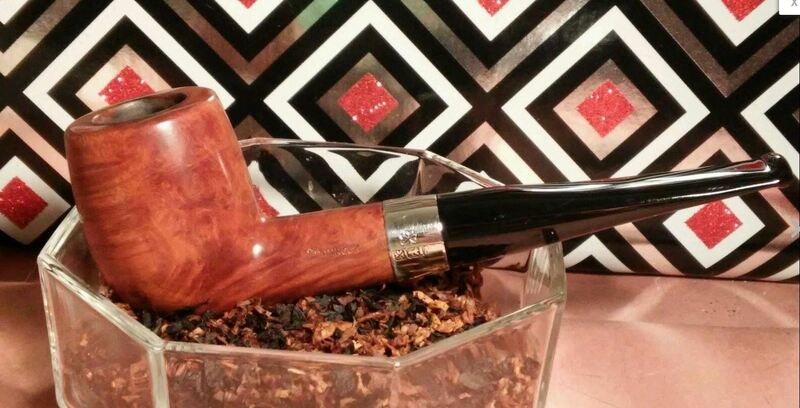 I wonder if a gallery section of the blog would be fun for readers to post their own pipes in shapes discussed here. What do you think? With an ebonite stem, it might be just fine, right? But I do like the plump look of the P-Lip, and its smoking qualities, on the whole, better. I’ve got the 107 in a Donegal Rocky & Dublin Castle. Both are shorter than my 106’s. I’ve never seen a Rocky in a 107–sound beautiful. The shortness adds to the chubbiness, right? Yes, though I’ve noticed there’s a lot of overlap/variance among the large billiards (I just got an Aran 106 that’s more an x105). BTW Mark, any tips on removing stem oxidation??? Hi Rob, I’ll figure out how you can send the photo. In the meantime, Steve Laug’s Reborn Briars blog has all the information you’ll need on stem deoxidation. It varies depending on materials in hand, experience with D-I-Y and the stem itself. Another great article. I hadn’t considered the contribution to the aesthetics of a pipe by the use of the p-lip stem. I love a tapered stem pipe. However, sometimes the length of the stem creates a button this is just too thick and/or clunky. I agree on the thickness of the button–esp. as regards newer P-Lip stems, which have degraded since the early 1990s. Not all, but certainly the current rendition on the Systems and the straights are almost parodies of the original concept. Older is better. I have complained, and am thinking of writing a blog comparing the older with the newer. Charles Peterson would be embarrassed, I think, to see these new stems. A correctly made P-Lip has a very comfortable lower shelf, which the tongue naturally slot into, and a ridge on the upper and lower button that makes clinching even easier–not harder–than on a fishtail. Until my recent 9BC aquisition, I’d only had modern (acrylic) p-lip stems and found them wanting. I agree, the p-lip on my Pre-Republic pipe is quite comfortable. My other Pre-Republic has a fishtale stem (also super-comfy and on par with my Comoys/Sasieni’s of that era). Okay, you have extolled the asthetic beauty of the 107 with tapered P-lip stem and here I sit with a black 107, silver spigot with the fishtail mouthpiece. She is not looking as beautiful now as she was before I read this article. Hey, we’re not judging anyone here! We all have a few fishtale stems on our racks, that doesn’t make us bad people, right? Actually, I’d love to have a P-lip and fishtale version of several of my shapes. Have to agree with you there. And Don’s silver spigot 107 sounds like a beautiful beast, doesn’t it? I’ve got several F/Ts myself. If I say too much about the P-Lip, it’s only because so few smoke it & many don’t realize that Charles Peterson’s patent stem & lip really are pretty marvelous smoking devices.